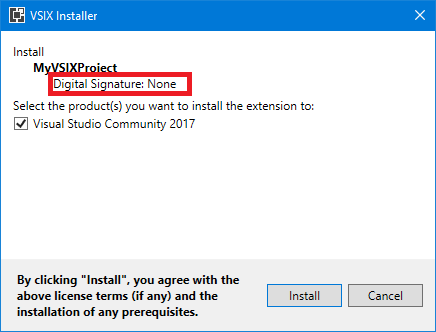 You know that I am such a big fan of targeting multiple Visual Studio versions with the same VSIX file that I wrote an article for MSDN Magazine explaining the approach to target from Visual Studio 2012 to Visual Studio 2017. In that article I didn’t explain how to code sign such VSIX file to work with multiple Visual Studio versions but this week I have got a (personal) code signing certificate. In the samples that follow, I will assume that you have the vsixsigntool.exe file and a code signing certificate named CodeSigningCertificate.pfx in the same bin\debug folder that contains a vsix file named MyVSIXProject.vsix. But that bug is already fixed and you can specify the higher version. It was perfect in most aspects because I owned the code and could adapt it to my needs but it had one important inconvenient: it didn’t allow Continuous Integration (CI). Instead, I ran the tests manually before each (monthly) build. 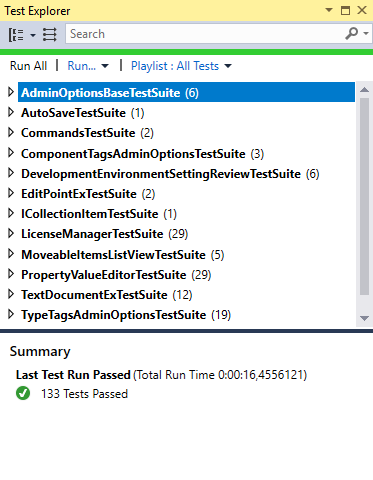 It had another inconvenient: I learned automated testing by myself without formal training and I ended with tons of integration tests (which use the real Visual Studio to host the extension), no system tests (that would mock Visual Studio) and no unit tests (that just test a single method or class). I know now that, for performance reasons, it is much better to have have a pyramid with tons of unit tests, lots of system tests and few integration tests. 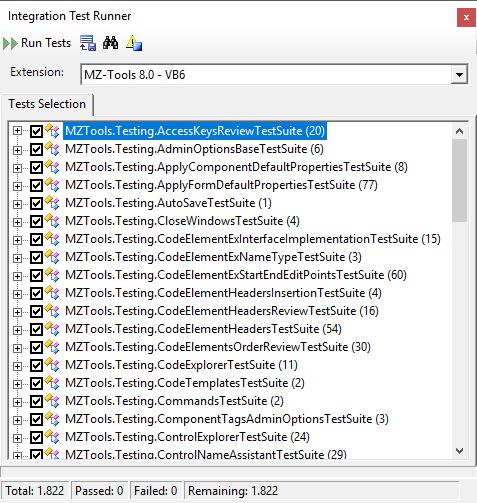 Once I finish the system tests for Visual Studio, the next step is to give another try to run the integration tests using the test runner of Visual Studio, rather than my own test runner, which will allow me Continuous Integration not only for system tests, but also for integration tests. For such approach, I learned in the Two videos about building High Performance Extensions by Omer Raviv about the Microsoft/VisualStudio-TestHost project on GitHub. I have still to read and learn about it, but I think it is based on the code of the VS TestHost of 2008 and hopefully these 10 years have been used to solve the problems that caused me to abandon that approach. Omer Raviv, author of the OzCode extension for Visual Studio, has recorded two videos with Robert Green on Channel 9 about building high performance extensions for Visual Studio. If creating extensions for Visual Studio is already tricky, creating high performance extensions is quite difficult and Omer has some advices and techniques about it. For those kind of code elements, the code model throws COMException (not even NotImplementedException), when it should return valid values since those expression-bodied members have…well, a body. Today I have reported the bug on the GitHub project for Roslyn, since Microsoft changed the implementation of the automation code model (EnvDTE.Project.CodeModel, EnvDTE.ProjectItem.FileCodeModel) for Visual Studio 2015 to be based on the underlying .NET Compiler Platform (“Roslyn”). As a workaround for this bug, I assumed that the expression-bodied member expands to a single line, and I searched the string “=>” to find the start of the body. It allows several Visual Studio editions (Community, Professional, Enterprise) to coexist at the same time on the same machine. For VSX developers, this means that Visual Studio 2017 installations now use different folders on disk, and instance Ids. It uses its own private registry. This post is about this. HKEY_LOCAL_MACHINE\SOFTWARE\WOW6432Node\Microsoft\VisualStudio\<version>: this per-machine entry was created when Visual Studio was installed (which required admin rights) and 3rd party extensions could add registry entries to it (to register packages or DDEX providers, etc.) 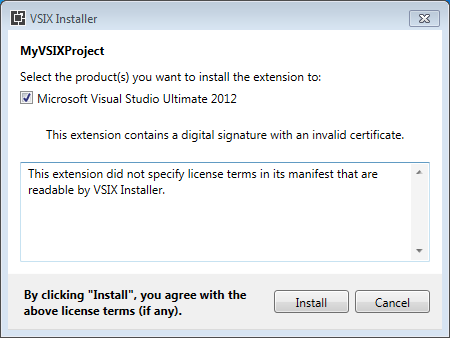 because it was never deleted (otherwise Visual Studio would become unusable and would require reinstallation). HKEY_CURRENT_USER\SOFTWARE\Microsoft\VisualStudio\<version>: this per-user entry was created the first time Visual Studio was launched for a user account, and contained per-user settings. It was never deleted (otherwise user settings would be lost). Per-user and per-machine .pkgdef files on disk. So, from time to time, Visual Studio 2010 copied to a per-user configuration the per-machine configuration (source #1) along with per-machine and per-user .pkgdef files on disk (source #2). This process happened when Visual Studio was launched for the first time on a user account, after a change of configuration, etc. And for this to work, at run-time the devenv.exe process redirects HKEY_LOCAL_MACHINE\SOFTWARE\WOW6432Node\Microsoft\VisualStudio\<version> to HKEY_CURRENT_USER\SOFTWARE\Microsoft\VisualStudio\<version>_Config. All that means that 3rd party setups of extensions shouldn’t write directly to the HKEY_CURRENT_USER\SOFTWARE\Microsoft\VisualStudio\<version>_Config key, because it could be deleted and created again at any time. Instead, setups should either write directly to HKEY_LOCAL_MACHINE\SOFTWARE\WOW6432Node\Microsoft\VisualStudio\<version> (which requires admin rights), to HKEY_CURRENT_USER\SOFTWARE\Microsoft\VisualStudio\<version> (which doesn’t require admin rights), or, better yet, avoid completely writing to the registry and use instead .pkgdef files on disk, either on per-machine folders (which requires admin rights) or on per-user folders (which doesn’t require admin rights). The private registry (privateregistry.bin file) is per-user, not per-machine. As such, it is not created when Visual Studio is installed, but when Visual Studio is launched for the first time for a user account. The private registry provides two keys: 15.0_<instance-id> and 15.0_<instance-id>_Config. The key 15.0_<instance-id> is equivalent to HKEY_CURRENT_USER\SOFTWARE\Microsoft\VisualStudio\<version> in previous versions. As such, it is never deleted (otherwise a user would lose her per-user configuration). The key 15.0_<instance-id>_Config is equivalent to HKEY_CURRENT_USER\SOFTWARE\Microsoft\VisualStudio\<version>_Config in previous versions. As such, it can be deleted and recreated by Visual Studio when it needs to update the configuration. There is no per-machine private registry. So, there is no equivalent of HKEY_LOCAL_MACHINE\SOFTWARE\WOW6432Node\Microsoft\VisualStudio\15.0 (well, such key exists, but it stores minimal settings). The installation of Visual Studio 2017 uses exclusively per-machine .pkgdef files instead that are scanned when Visual Studio is loaded for the first time for a user account to create the key 15.0_<instance-id>_Config in the per-user private registry. 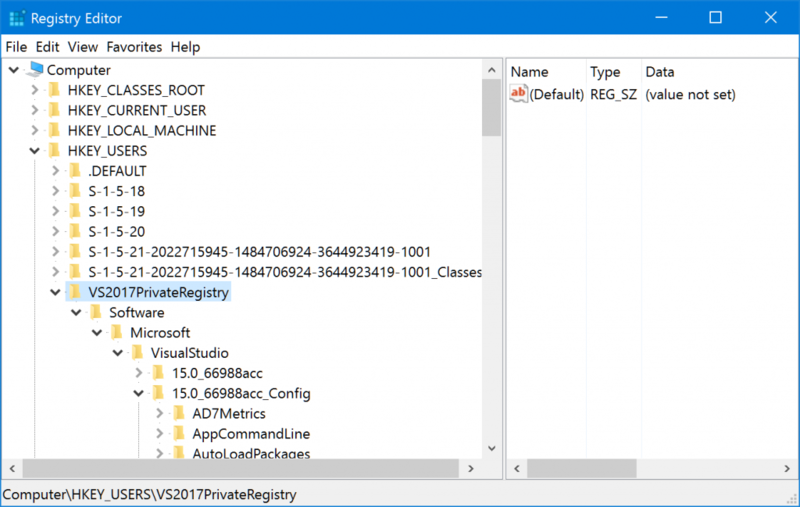 At run-time, the devenv.exe process of Visual Studio 2017 redirects registry operations on Visual Studio keys to the privateregistry.bin file. So, this change is transparent for extensions (DLLs) that run in the devenv.exe process. Setups (which are external processes) are not so lucky. While they could use the RegLoadAppKey function to write to the 15.0_<instance-id> key for per-user extensions (never for 15.0_<instance-id>_Config, which would be overwritten later), it is much better to switch to .pkgdef files on disk (either per-machine, or per-user). 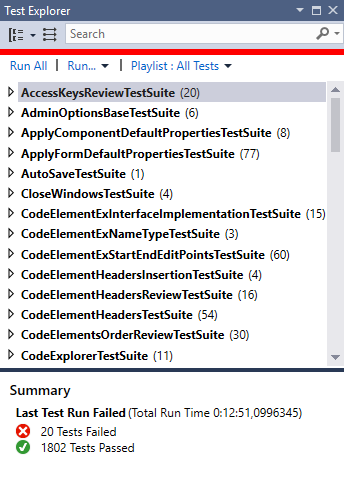 If you really need to mess with the Visual Studio setup, then see Microsoft/vs-setup-samples. The use of a private registry file causes that if you want to know programmatically the installed editions of Visual Studio 2017, the old approaches don’t work. 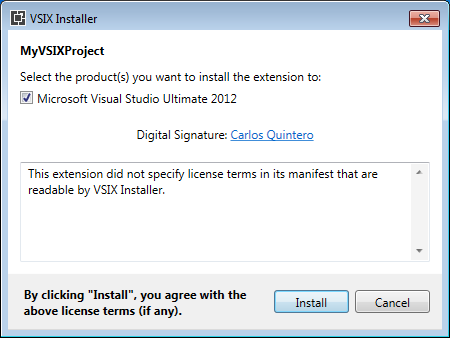 For example, my article HOWTO: Detect installed Visual Studio editions, packages or service packs is now obsolete. “This is a sample in various programming languages that demonstrates how developers can use the new Visual Studio setup query API. The included samples show how to use the new setup configuration API for discovering instances of Visual Studio 2017”. As I explained in the post Migrating the build of a VSIX project to a build server if you are a solo developer, I am taking the steps to build my MZ-Tools extension on a build/release server. As part of that process, I realized than rather than installing Visual Studio 2017 Community edition on the server, I could use the Visual Studio 2017 Build Tools that were thought, well, for build servers that don’t need the overhead of a Visual Studio 2017 installation. They are a lightweight version of Visual Studio 2017 without the IDE (devenv.exe executable). They can be used to build either managed (C#, VB.NET, etc.) projects or native (C++) projects. 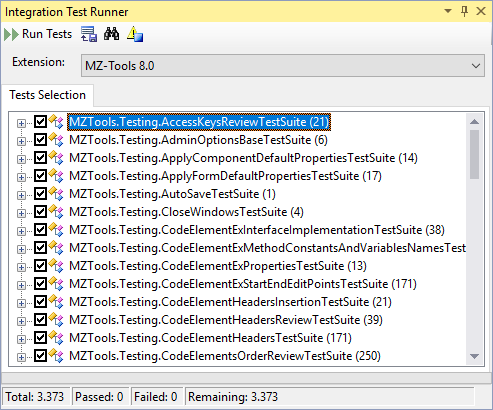 Incidentally my MZ-Tools solution has both type of projects. 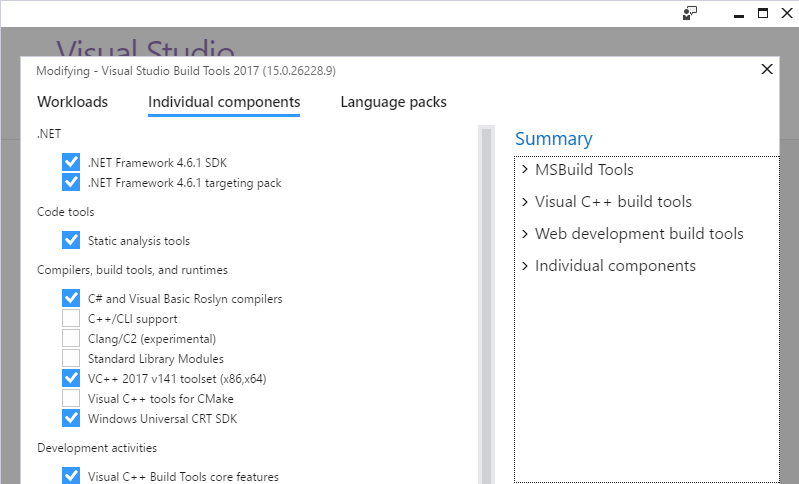 A built-in (non-optional) set of components to build MSBuild-based projects (for example managed projects). An optional workload “Visual C++ build tools”. An optional workload “Web development build tools”. My obfuscator tool needs the .NET Framework 3.5 SDK (or the .NET Framework 2.0 SDK). 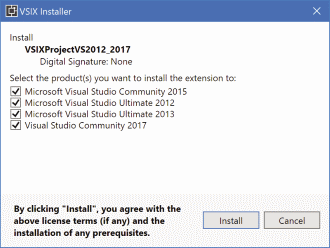 While the Visual Studio 2017 Community installer provides the optional individual component “.NET Framework 3.5 developments tools”, the installer of Build Tools 2017 doesn’t. That is not only a pity but also causes a bug if you install yourself the Windows 7.0 SDK that contains the .NET Framework 3.5 SDK that I reported here: the resource .resx files of a .NET project targeting .NET Framework 2.0 are compiled using the Assembly Linker (al.exe tool) of the .NET Framework 4.0, which will cause them to fail silently at run-time. 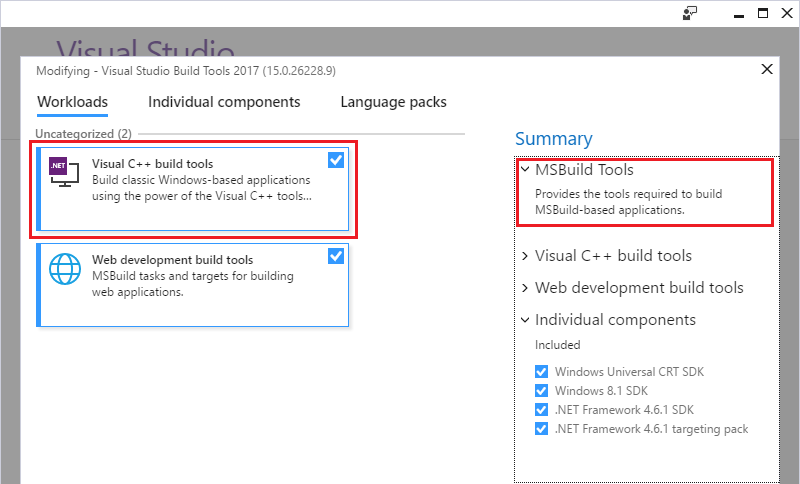 Microsoft fixed the bug just in time for RTM in Visual Studio 2017, but the Build Tools 2017 still has the bug due to the lack of the “.NET Framework 3.5 developments tools”. There is a fix that I explained in the bug report if you find this problem. I have also requested to Microsoft to include the “.NET Framework 3.5 developments tools” in the installer of Build Tools 2017. 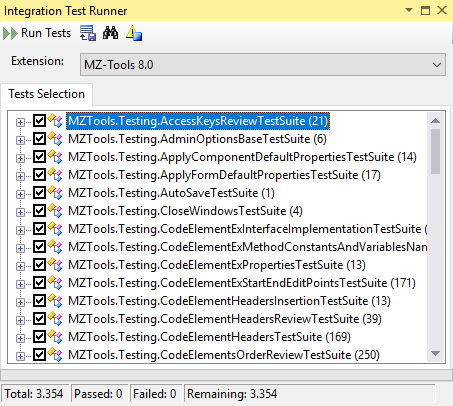 My extension for Visual Studio targets version 2012, so I need to stick to .NET Framework 4.5, not some higher version. Since that version is not provided by the Build Tools 2017, I need to install the Windows 8.0 SDK, that contains the .NET Framework 4.5 assemblies and SDK. “Visual C++ ATL Support”: required to get files such as atlbase.h, etc. “Windows 8.1 SDK”: I could upgrade to some Windows 10 SDK version but they occupy much more space on disk. “UCRT SDK”: the Universal Common RunTime that provides files such errno.h and other files in the folder “C:\Program Files (x86)\Windows Kits\10\Include\10.0.10240.0\ucrt”. “.NET Framework 4.6.1 SDK”: to get files such as mscoree.h / mscoree.lib in the folder “C:\Program Files (x86)\Windows Kits\NETFXSDK\4.6.1\”. My build script uses tf.exe to set a workspace and download the latest sources. Alas, tf.exe is not installed with Build Tools 2017 (Visual Studio 2017 installs the Team Explorer extension, that contains that file in the folder “C:\Program Files (x86)\Microsoft Visual Studio\2017\Community\Common7\IDE\CommonExtensions\Microsoft\TeamFoundation\Team Explorer”). Now there is a standalone installer for Team Explorer (that includes tf.exe) announced here. Since that’s a bit overkill, I just copied tf.exe and the required dlls. The build script needs also nuget.exe, but that’s easy to get. First, the error “Error’MSB4226: The imported project “(…)\VSSDK\Microsoft.VsSDK.targets” was not found.” Initially I thought it was a bug, that I reported to Microsoft here, but I discovered that the problem was solved setting the “VisualStudioVersion” MSBuild property, something that a machine with the full Visual Studio 2017 does and that a machine with the Build Tools 2017 does if you open a developer command prompt. Since I was not using it, I passed it as a parameter to the MSBuild script. It can be defined too inside the .csproj file, something that previous Visual Studio versions did automatically but recent versions don’t. 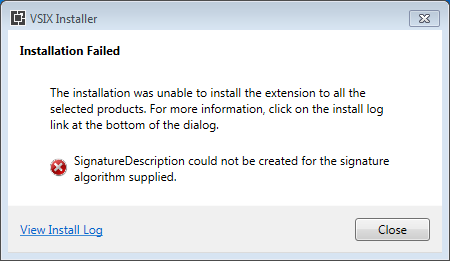 Finally, when I thought that all obstacles were solved, I got an error about the Microsoft.Visualstudio.Shell.Interop.dll being delay-signed rather than strong-signed. Since my development machine has tons of Visual Studio versions and SDKs, I discovered that all the Microsoft.Visualstudio.Shell.Interop.dll files were strong-named except an old one, which somehow Microsoft shipped delay-signed, and that was the one that I was referencing. So, I only need to change it by the correct version. And finally, my extension generates a VSIX file on a release server with only the Build Tools 2017 plus some additional components, but without Visual Studio 2017 installed. 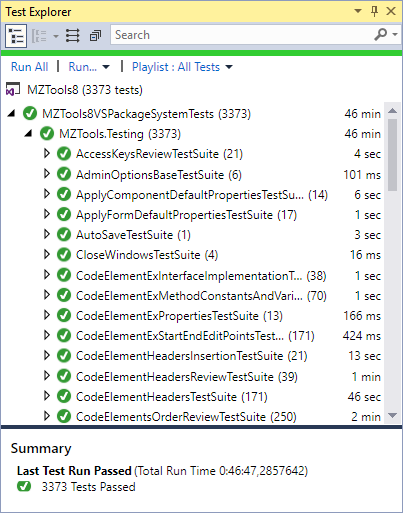 The next step is to install some agent to connect to the Build/Release Management of Visual Studio Team Services. Visual Studio 2008 started to offer a new form of extensibility: a whole IDE for your app! That is, reusing the core of the Visual Studio IDE for your own tool instead of reinventing the wheel creating a new IDE from scratch. This is named Visual Studio Shell and there are two flavors: the “Isolated Shell“, where your app has its own instance of Visual Studio Shell even if the Visual Studio IDE is already installed (because the user is a developer); and the “Integrated Shell“, where if the Visual Studio IDE is already installed, your Visual Studio Shell integrates with it (otherwise is installed anyway). At the time of this writing, the Visual Studio Shells for Visual Studio 2017 haven’t been announced (yet). It seems that Microsoft will make them available, but they need some time to accommodate the new modular setup of Visual Studio 2017. For example, Microsoft didn’t release Team Explorer 2017 for the RTM of Visual Studio 2017 and was released a week ago. Likely the same will happen with the shells at some point. What about Visual Studio 2015 Shells? It seems that Microsoft wanted to know usage and scenarios, so they moved the downloads to Microsoft Connect and “Before you can access the isolated and integrated shell redistributable packages, you will be asked to fill out a brief customer survey. After filling out the survey, you’ll be directed to a Visual Studio Connect page with redistributable package download links. 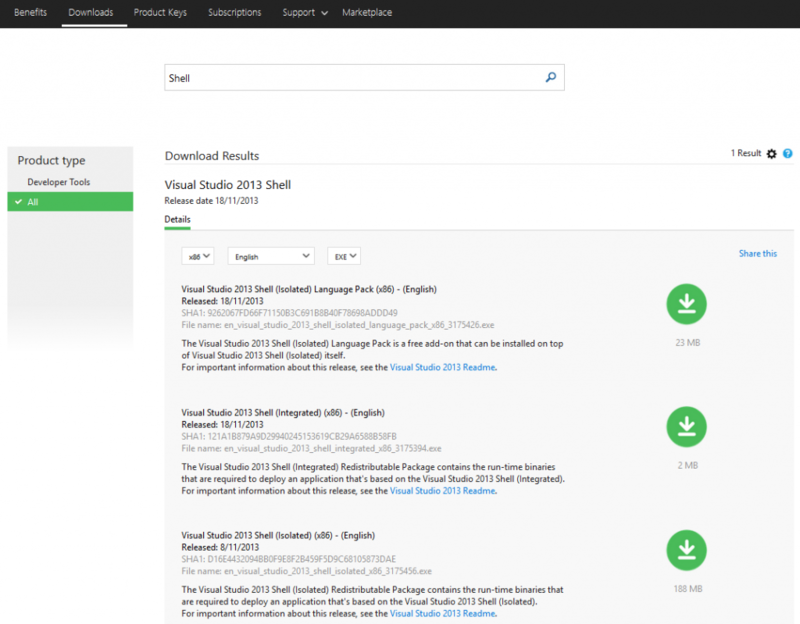 You can find the download links on subsequent visits to the Visual Studio Connect site under the PROGRAMS | VISUAL STUDIO 2015 INTEGRATED AND ISOLATED SHELL tab“. Alas, the survey expired (“This invitation is no longer valid. Either the program is full or the invitation cannot be used by any additional people. We are sorry for the inconvenience.“) and now it seems impossible to get them. And now, even the link for the survey https://go.microsoft.com/fwlink/?LinkId=616021, that redirects to https://connect.microsoft.com/VisualStudio/ExtendVS, doesn’t even work, at least for me (“Page Not Found The content that you requested cannot be found or you do not have permission to view it.”). It would be nice if Microsoft provided a centralized, public page with the downloads that VSX developers may require to develop and test extensions (Visual Studio SDKs, .NET Framework SDKs, Visual Studio Shells, Community editions, etc.) and, very important, from the current Visual Studio version going back to… Visual Studio 2005 and .NET Framework 2.0. Not everyone wants or can use the latest bits. I keep a couple of hard disks at home and at my basement with all the required Visual Studio versions, Visual Studio SDKs, Windows SDKs, .NET Framework SDKs, Windows OS versions, etc. fearing that they would disappear from the web some day (which certainly is happening with the shells). And now that Microsoft uses web-based installers for Visual Studio with no .iso file provided, I am even afraid that my Visual Studio 2017 installer won’t work in a few years, so I have to create an offline installer. This is one of those posts that I write mainly for myself in the future, but that maybe can be useful for others developers that want or need to run Visual Basic 6.0 without admin rights on Windows 7 or Windows 10. 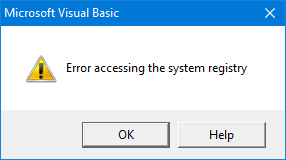 A solution is of course to run Visual Basic 6.0 with admin rights, and I have been doing it so for some years. But that requires Visual Studio running also with admin rights, to be able to debug an add-in project loaded on Visual Basic 6.0 (if Visual Studio is not running with admin rights, it prompts you to restart with admin rights, but that’s quite annoying). But running Visual Studio all the time with admin rights only because of Visual Basic 6.0, when all the IDEs (Visual Studio, VBA) of my other add-ins wouldn’t require it, is somewhat overkill, and I really wanted to avoid it. But HKCR is actually a merged view of some keys of HKLM and some keys of HKCU, and clearly the failure was due to the HKLM side. Finally, a closer reading of the page Registry Virtualization on MSDN, section Controlling Registry Virtualization, gave me the clue: it happens that not all the keys of HKLM\Software are virtualized by default. In particular, the keys and subkeys of HKLM\Software\Classes, which are used when registering an ActiveX component, are not virtualized by default. Fortunately, you can use the reg.exe tool to query and virtualize them. Note: the fact that Visual Basic 6.0 is a 32-bit executable and that Process Monitor showed HKCR\TypeLib (that would belong to 64-bit) and not HKCR\WOW6432Node\TypeLib (that would belong to 32-bit) means that both keys (32-bit and 64-bit) are the same. Notice that in this case HCKR\WOW6432Node\Interface is shown, instead of HCKR\Interface, which means that the 32-bit and the 64-bit keys are different. And finally building the ActiveX didn’t cause any error. 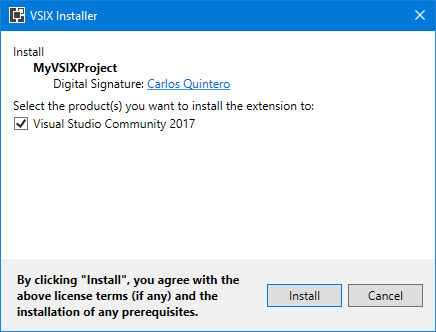 I am Carlos Quintero, former Microsoft Most Valuable Professional (MVP) 14 times (from 2004 to 2018) and passionate and specialist about Visual Studio Extensibility (VSX).